Drop all that excess baggage. Carry just what you need in this chic little wristlet. Made from leather. Zipper closure. Detachable wristlet strap. Logo hardware accent. 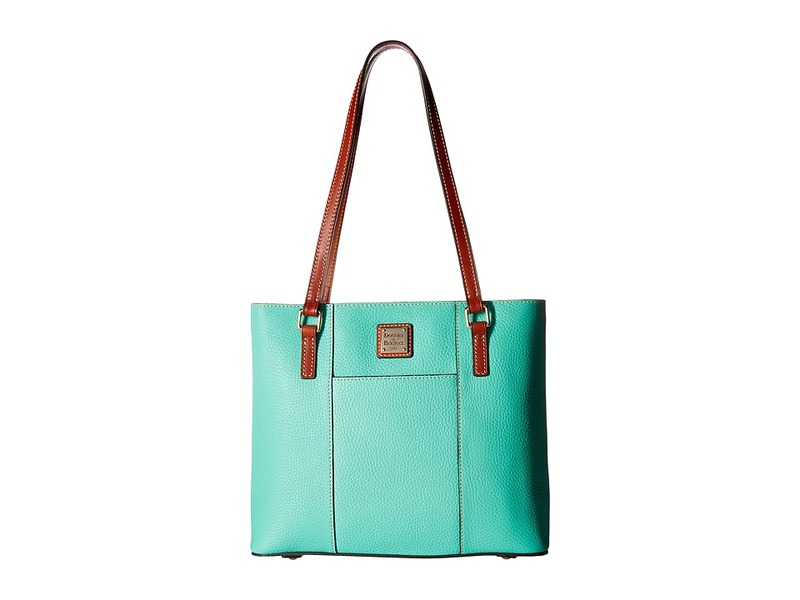 Lined interior features credit card slots, a zippered pocket, a slot for a slim cell phone and two compartments. Imported. Measurements: Bottom Width: 7 in Depth: 1 in Height: 4 in Weight: 7 oz Please note, the hardware color and interior lining may differ from the color shown in the photo. 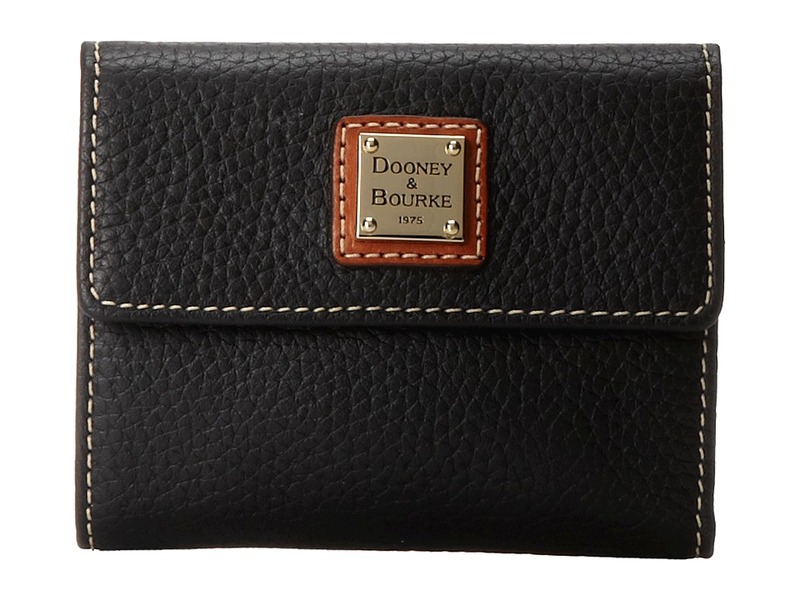 Grab a matching style with this small wallet from Dooney Bourke! Made of leather. Snap flap closure. Signature logo hardware. Exterior zipper pocket. Interior includes currency slot and credit card slots. Imported. Measurements: Bottom Width: 5 in Depth: 1 in Height: 4 in Weight: 4 oz Please note, the hardware color and interior lining may differ from the color shown in the photo. 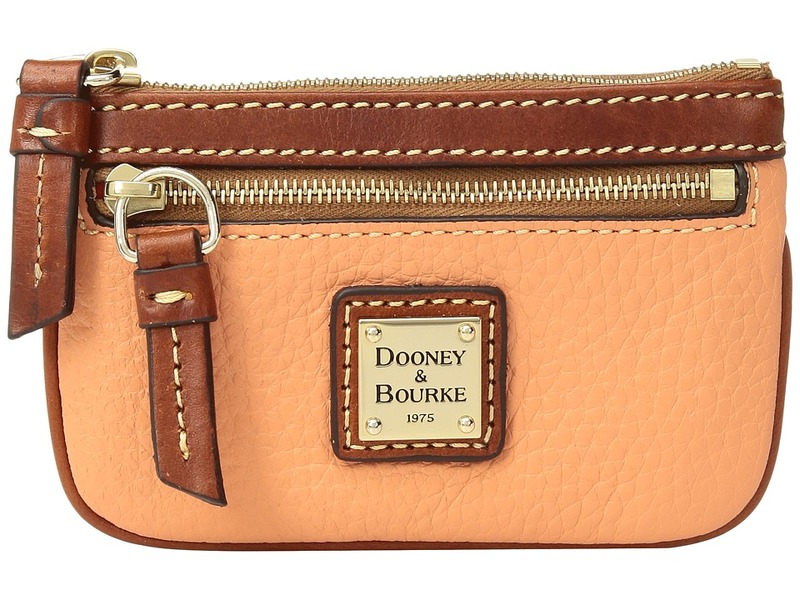 This slim Dooney Bourke crossbody bag is the perfect size for running errands. Made of durable pebble grain leather. Contrast leather trim detail. Metal logo tag on front of bag. Front zip pocket. Adjustable crossbody strap. Flat bottom. Top zip closure. Lined interior features one zip pocket, three slip pockets, and a key hook. Imported. Measurements: Bottom Width: 10 in Depth: 4 in Height: 10 1 2 in Strap Length: 54 in Strap Drop: 24 in Weight: 1 lb 7 oz Please note, the hardware color and interior lining may differ from the color shown in the photo. 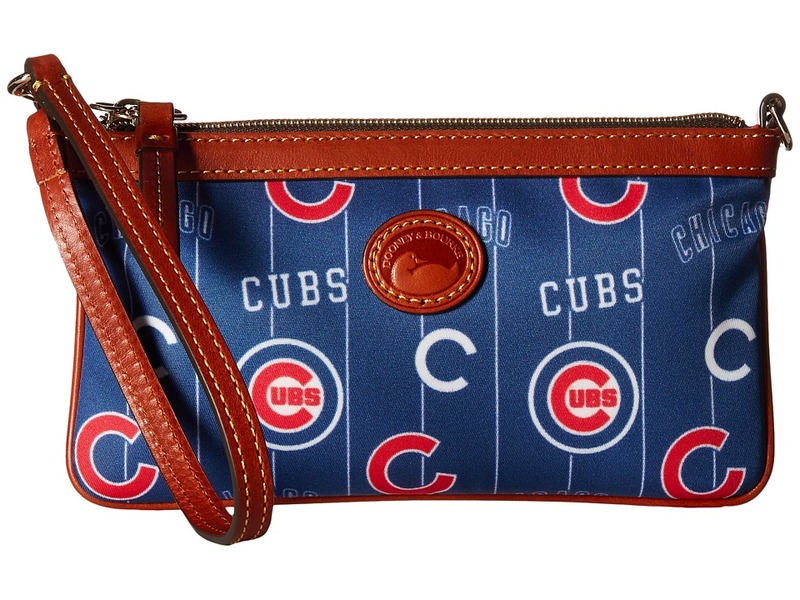 Sport your favorite team with the MLB Large Slim Wristlet from Dooney Bourke! Made of coated cotton fabric. Zipper closure. Shoulder strap. Signature logo hardware. Comes in a variety of team prints. Lined interior includes slip pocket. Imported. Measurements: Bottom Width: 8 in Depth: 1 4 in Height: 4 3 4 in Handle Length: 15 in Handle Drop: 6 in Weight: 5 oz Please note, the hardware color and interior lining may differ from the color shown in the photo. 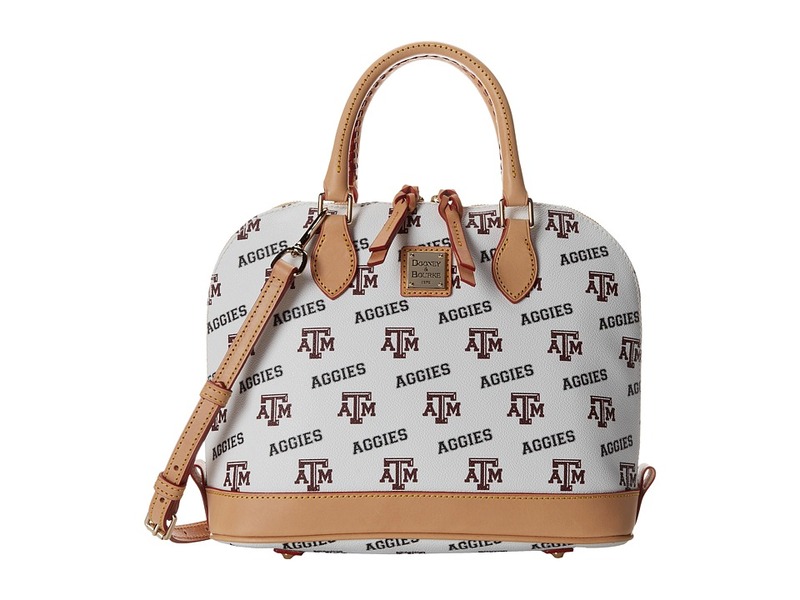 Sport your favorite collegiate team with this Dooney Bourke satchel! Made of coated canvas with leather trim. Signature logo hardware. Dual top handles. Detachable, adjustable shoulder strap. Flat bottom with protective feet. Top zip closure. Lined interior features a zip pocket, two slip pockets, and a key hook. Imported. Measurements: Bottom Width: 14 in Depth: 5 in Height: 9 1 2 in Handle Length: 14 in Handle Drop: 4 in Accessory Strap Length: 34 in Accessory Strap Drop: 16 in Weight: 1 lb 9 oz Please note, the hardware color and interior lining may differ from the color shown in the photo. 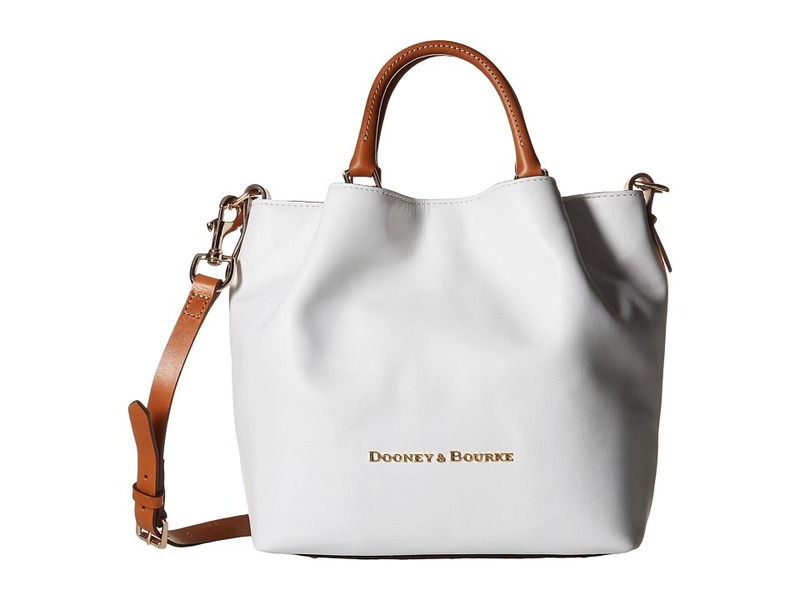 Tote your daily essentials with comfort and ease in the fashionable Dooney Bourke Pebble Small Lexington Shopper. Made of pebbled leather. Zipper closure. Dual shoulder straps. Comes in a variety of pop colors. Signature logo hardware. Exterior features two slip pockets. Flat base with metal feet. Lined interior features zipper pocket, three slip pockets, and key hook. Imported. Measurements: Bottom Width: 11 in Depth: 3 3 4 in Height: 10 in Strap Length: 24 1 2 in Strap Drop: 11 in Weight: 1 lb 12.6 oz Please note, the hardware color and interior lining may differ from the color shown in the photo. 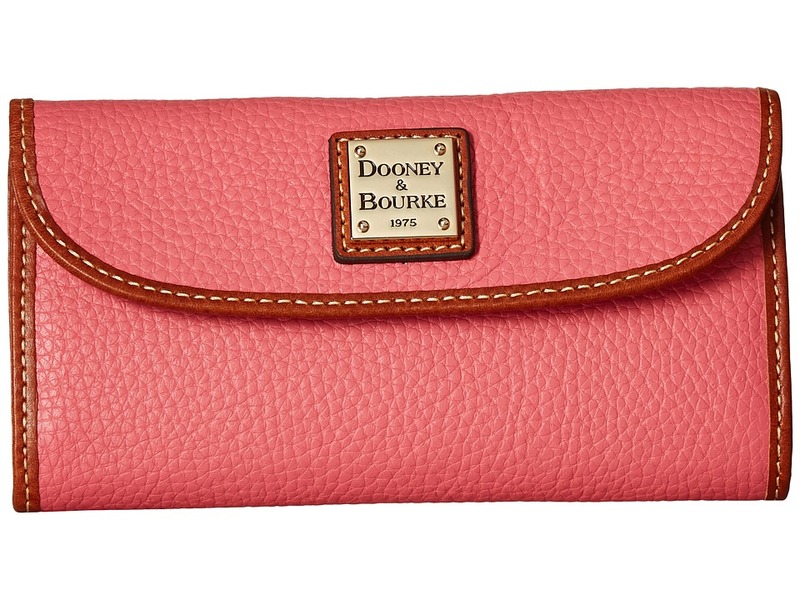 Part of the Dooney Bourke Pebble Grain Collection. Small coin case made of durable, textured leather. Signature metal logo tag. Front zip pocket. Back slip pocket. Top zip closure with key ring. Imported. Measurements: Bottom Width: 5 in Depth: 1 2 in Height: 3 1 2 in Weight: 2.8 oz Please note, the hardware color and interior lining may differ from the color shown in the photo. 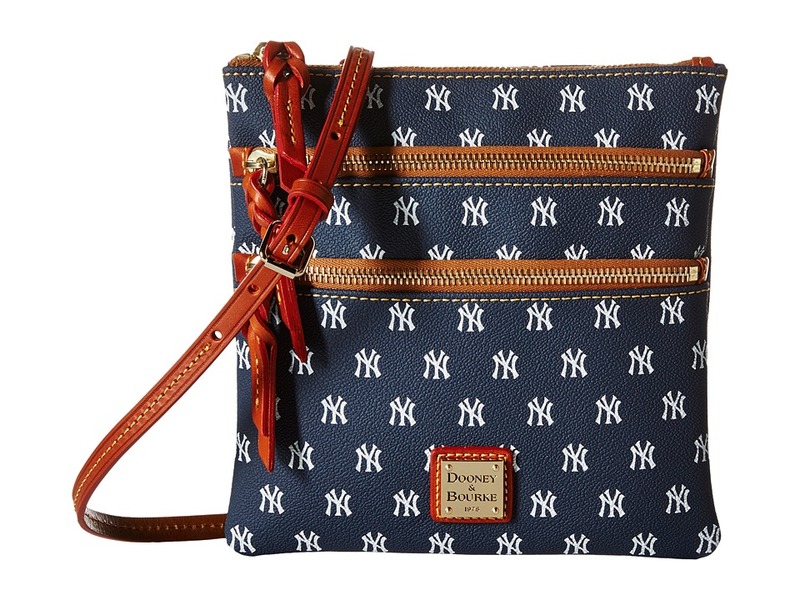 Show support for your favorite team with the Dooney Bourke MLB Triple Zip Crossbody. Made of coated canvas with leather trim. Signature logo hardware. Adjustable crossbody strap. Two front exterior zip pockets. Main compartment with top zip closure. Interior lining. Imported. Measurements: Bottom Width: 8 in Depth: 1 4 in Height: 8 in Strap Length: 52 in Strap Drop: 25 in Weight: 10 oz Please note, the hardware color and interior lining may differ from the color shown in the photo. 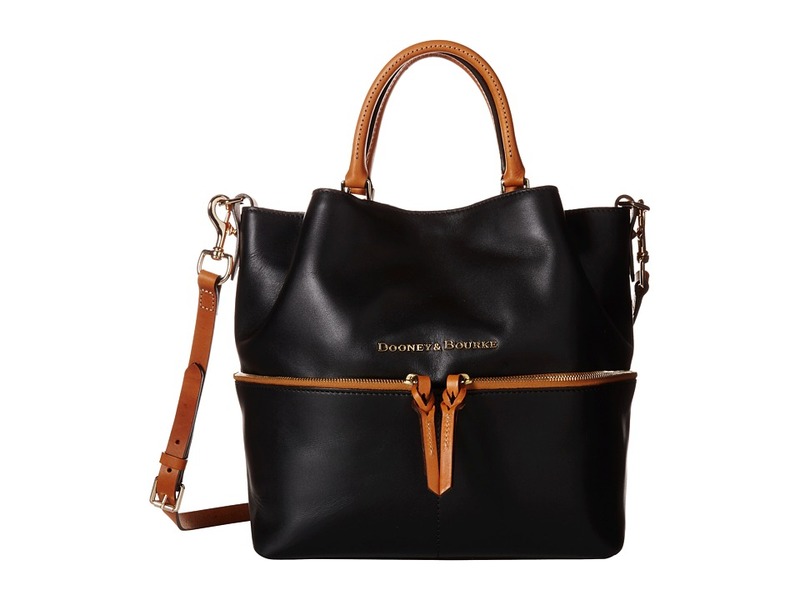 The sophisticated City Large Barlow from Dooney Bourke is versatile and stylish. Made of genuine leather. Magnetic leather closure. Dual rolled top carry straps as well as an adjustable/removable shoulder strap. Signature logo hardware. Flat base with metal feet. Lined interior includes zipper pocket, slip pockets, and key holder. Imported. Measurements: Bottom Width: 12 in Depth: 6 1 2 in Height: 10 in Strap Length: 13 in Strap Drop: 5 1 2 in Handle Length: 49 1 2 in Handle Drop: 23 1 2 in Weight: 2 lbs 9 oz Please note, the hardware color and interior lining may differ from the color shown in the photo. 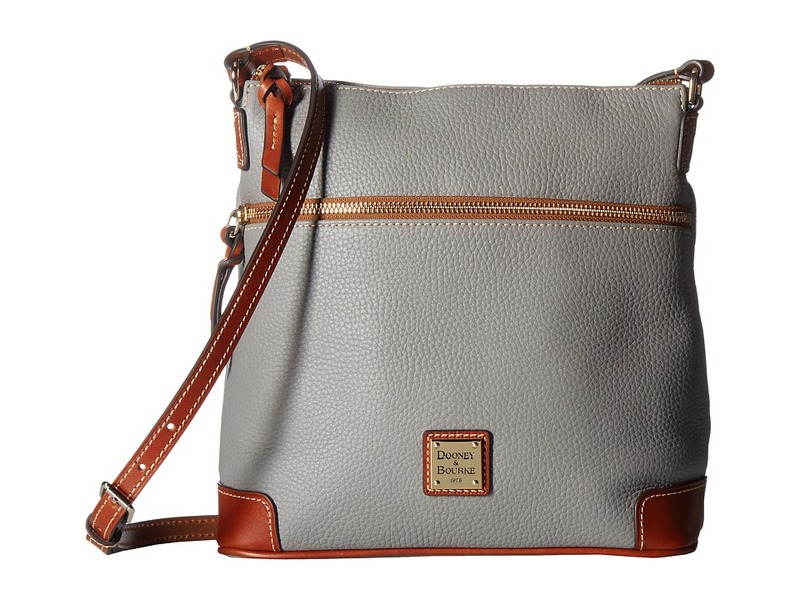 The Dooney Bourke City Flynn is boho chic meets uptown sophistication, making it the perfect everyday bag! Made of genuine leather. Magnetic leather closure. Dual shoulder straps. Two exterior magnetic snap slip pockets. Signature logo hardware. Flat base with metal feet. Lined interior includes zipper pocket, slip pockets, credit card slot, and key holder. Imported. Measurements: Bottom Width: 12 in Depth: 6 1 2 in Height: 11 in Strap Length: 24 in Strap Drop: 11 in Weight: 2 lbs 8.2 oz Please note, the hardware color and interior lining may differ from the color shown in the photo. 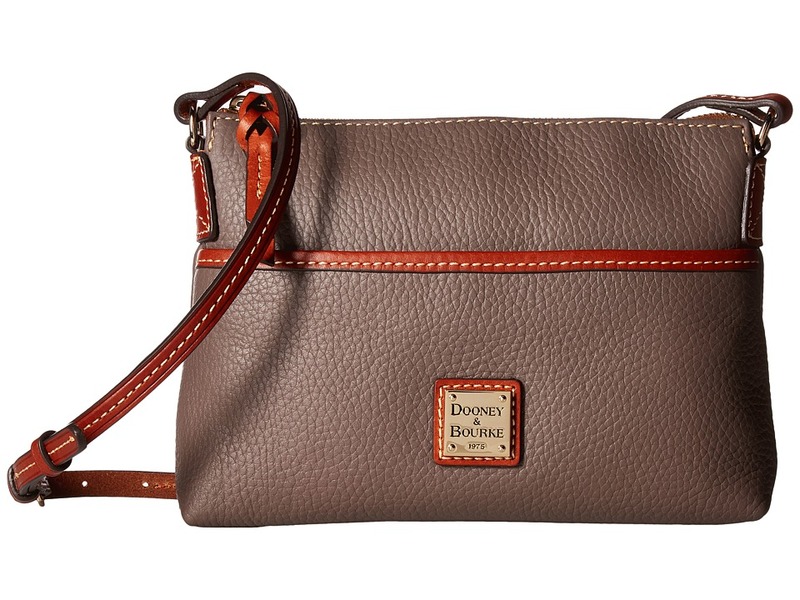 The fashion forward City Dawson from Dooney Bourke is a timeless look. Made of genuine leather. Magnetic snap closure. Dual rolled top carry straps as well as an adjustable/removable shoulder strap. Two exterior zip pockets. Signature logo hardware. Flat base with metal feet. Lined interior includes zipper pocket, slip pockets, and key holder. Imported. Measurements: Bottom Width: 11 in Depth: 5 1 2 in Height: 11 1 4 in Strap Length: 50 in Strap Drop: 25 1 2 in Handle Length: 12 1 2 in Handle Drop: 5 1 2 in Weight: 2 lbs 10.4 oz Please note, the hardware color and interior lining may differ from the color shown in the photo. 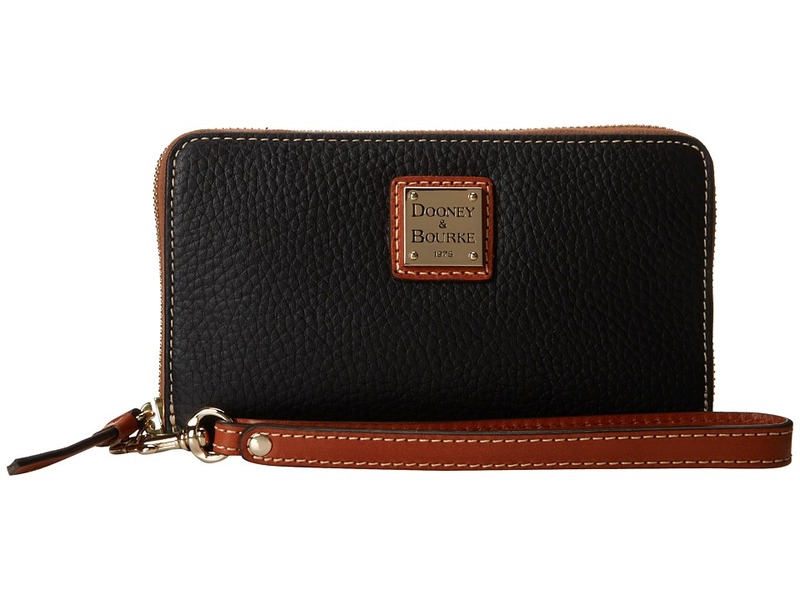 This fashionable Dooney Bourke crossbody bag is the perfect size for the absolute essentials. Made of durable pebble grain leather. Top zip closure. Adjustable crossbody strap. Contrast leather trim detail. Metal logo tag on front of bag. Front slip pocket. Flat bottom. Lined interior features one zip pocket and a key hook. Imported. Measurements: Bottom Width: 8 in Depth: 2 1 4 in Height: 6 in Strap Length: 53 in Strap Drop: 25 in Weight: 12.2 oz Please note, the hardware color and interior lining may differ from the color shown in the photo. 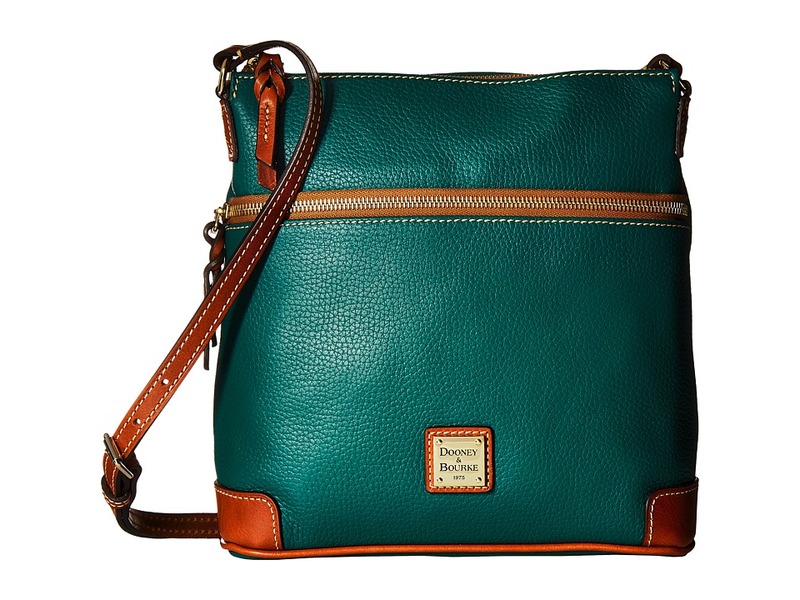 This slim Dooney Bourke crossbody bag is the perfect size for running errands. Made of durable pebble grain leather. Contrast leather trim detail. Metal logo tag on front of bag. Front zip pocket. Adjustable crossbody strap. Flat bottom. Top zip closure. Lined interior features one zip pocket, three slip pockets, and a key hook. Imported. Measurements: Bottom Width: 10 in Depth: 4 in Height: 10 in Strap Length: 50 in Strap Drop: 24 in Weight: 1 lb 4.4 oz Please note, the hardware color and interior lining may differ from the color shown in the photo. 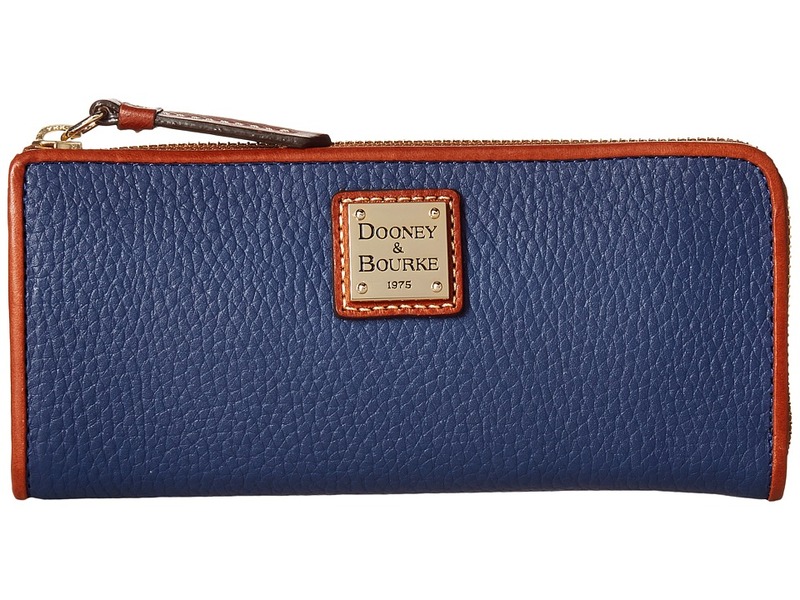 Stash your daily essentials in the chic Dooney Bourke Pebble Continental Clutch. Softly pebbled leather. Magnetic-snap flap closure. Exterior zipper pocket at the back. Signature logo plaque. Leather interior with four bill compartments and seven card slots. Imported. Measurements: Bottom Width: 7 in Depth: 3 4 in Height: 3 1 2 in Weight: 6.4 oz Please note, the hardware color and interior lining may differ from the color shown in the photo. 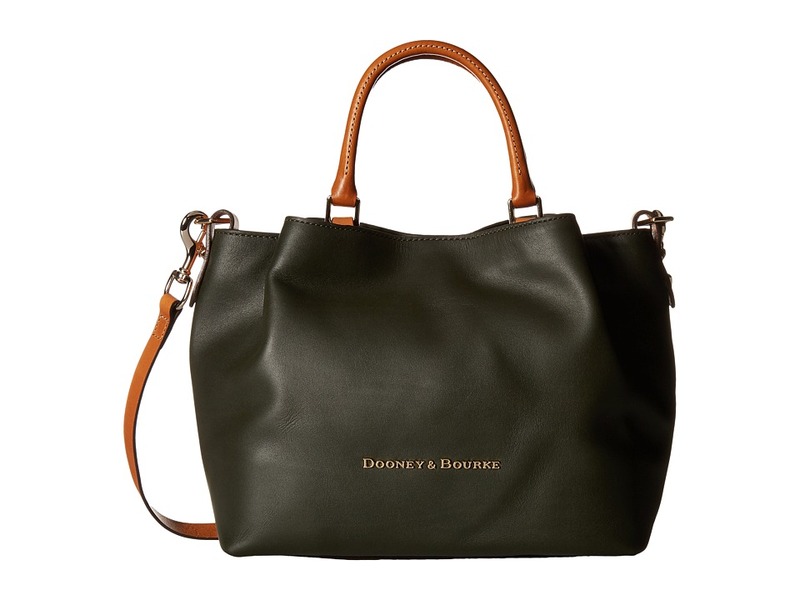 The Dooney Bourke Claremont collection is inspired by ~50s and ~60s California style, which is casual and timeless. Clutch-style wallet made of subtly textured leather with contrast trim. Signature hardware and logo. Zipper closure. Lined interior features a center zip compartment, two slip compartments, and eight card slots. Imported. Measurements: Bottom Width: 7 1 2 in Depth: 3 4 in Height: 3 1 2 in Weight: 7 oz This product may have a manufacturer~s warranty. Please visit the manufacturer~s website or contact us at for full manufacturer warranty details. Please note, the hardware color and interior lining may differ from the color shown in the photo. 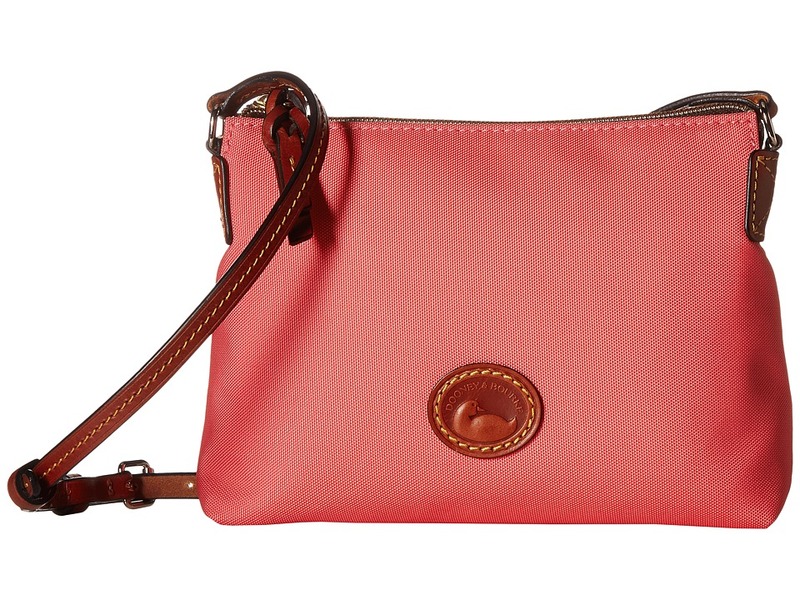 This fashionable and functional crossbody from Dooney and Bourke&amp#8482 is made of nylon with leather trim. Holds your wallet, keys, sunglasses, lipstick and personal technology. Single adjustable crossbody strap. Crossbody drop: 24 length. Embroidered duck detail. Flat bottom. Top zip closure. Interior lining with a back wall zip pocket and multifunctional slip pockets. Dimensions: 9 wide x 2 1/2 deep x 6 1/4 high. Measurements: Bottom Width: 8 in Depth: 2 in Height: 6 in Strap Length: 55 in Strap Drop: 26 in Weight: 8.4 oz Please note, the hardware color and interior lining may differ from the color shown in the photo. 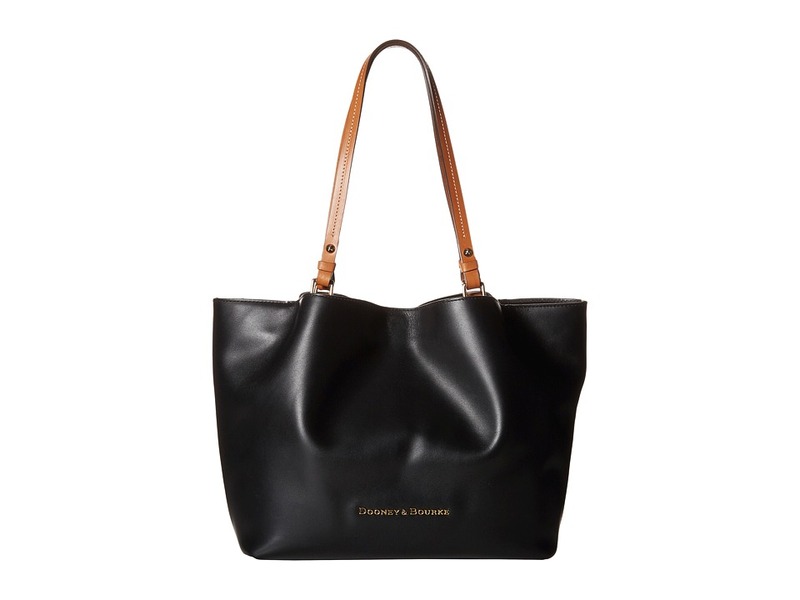 The sophisticated City Small Barlow from Dooney Bourke is versatile and stylish. Made of genuine leather. Magnetic snap closure. Dual rolled top carry straps as well as an adjustable/removable shoulder strap. Two exterior snap closure pockets. Signature logo hardware. Flat base with metal feet. Lined interior includes zipper pocket, slip pockets, and key holder. Imported. Measurements: Bottom Width: 10 in Depth: 4 3 4 in Height: 10 in Strap Length: 57 in Strap Drop: 27 in Handle Length: 12 in Handle Drop: 4 1 2 in Weight: 2 lbs 2 oz Please note, the hardware color and interior lining may differ from the color shown in the photo. 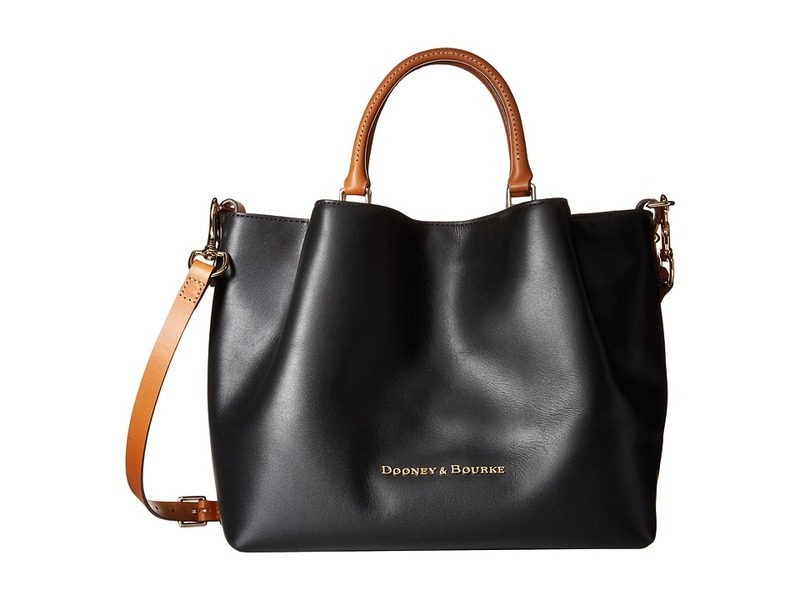 The sophisticated City Barlow from Dooney Bourke is versatile and stylish. Made of genuine leather. Magnetic snap closure. Dual rolled top carry straps as well as an adjustable/removable shoulder strap. Two exterior snap closure pockets. Signature logo hardware. Flat base with metal feet. Lined interior includes zipper pocket, slip pockets, and key holder. Imported. Measurements: Bottom Width: 11 in Depth: 4 1 2 in Height: 9 1 2 in Strap Length: 50 in Strap Drop: 24 in Handle Length: 11 1 2 in Handle Drop: 5 in Weight: 2 lbs 4.6 oz Please note, the hardware color and interior lining may differ from the color shown in the photo.